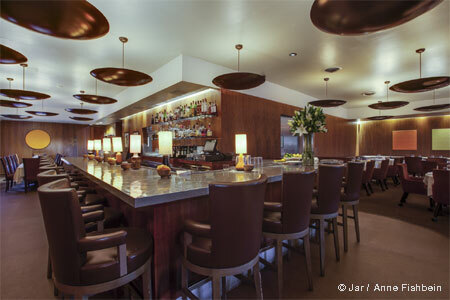 Pretty place to mix and mingle over craft cocktails at Kimpton Everly Hotel in Hollywood. About mixologist Dan Rook: Cocktailians should definitely not leave Ever Bar off their list of bar crawls, and quirky, creative mixologist Dan Rook is one reason why. As well as being a certified Cicerone, the Chicago native honed his skills in the Windy City’s bars, getting noticed for his signature pre-Prohibition era cocktails that incorporated local, seasonal ingredients. Here, he lets his imagination run wild, and the drinks truly offer something to talk about. 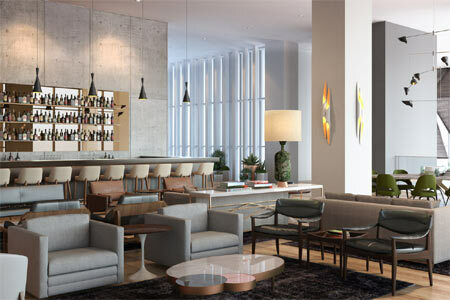 The décor: This lofty, mod spot is one of the coolest and prettiest lobby bars in LA, with soaring glass windows and tall white walls that frame sunset views and sparkling nightscapes. Lounge on midcentury sofas and chairs, or hang out at the sleek bar stocked with every kind of boutique whisky, gin and amaro you could want. Bartenders are friendly, and they mix up a good show. Rockin’ chill music washes over the attractive crowd, a blend from the Kimpton, local Pantages Hamilton-goers and stylish EaHo hipsters. Likes: Creative cocktail list; fun, elegantly mod space. Dislikes: A few too-provocative cocktails that aren’t tasty (at $16); sketchy street parking. Food & Drinks: With a nod to the iconic Capitol Records building around the corner, Rook divides his cocktail list into three sections: The Basement Tapes (forgotten classics), Reissues/B Sides (reimagined takes on clichéd drinks) and Riffs (elevated, modern cocktails). His “Millionaire,” for instance, becomes “Bone Thighs and Harmony” made with shochu, Grand Marnier, pomegranate, sage and duck confit bone broth. We’ll admit it was not our favorite (or one you may care to repeat), but others are eminently quaffable, like the Steve Mansfield Manhattan (bourbon, St. George coffee liqueur, and house-made arugula-apple amaro). Try a seductive gin cocktail with avocado, or a margarita that incorporates a gai-lan broccoli black garlic shrub. Seasonal specials may feature butternut squash jam or dandelion. Boutique beer and wines are all Californian. Upscale bar bites range from noshy (Wagyu beef jerky, avocado fries) to luxe (duck confit monkey bread, salmon poke tacos with caviar), and there’s also a filling brisket burger and Hotlanta chicken sandwich.